This Stir-fried Glutinous Rice is a long-standing, classic dim-sum in Chinese restaurants. Traditionally, the cooking method is very time and effort demanding, similar to the way how Italian risotto is cooked from raw to done. 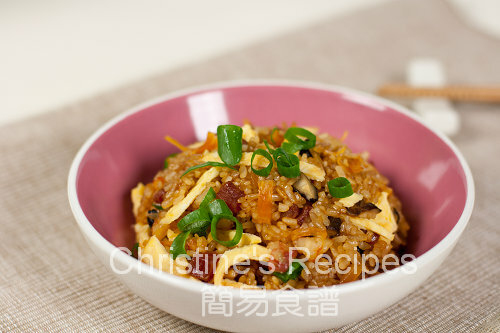 To cook Stir-fried Glutinous Rice is not hard at all. In fact, I heard many chefs in Chinese restaurants confess they won’t go through this route simply because of consideration of time and labor. Many Chinese people love to cook this dish at home in winter. I religiously followed the traditional way to cook the glutinous rice in order to get the right texture I wanted. Yet, I also share a cheating way of cooking this classic dish followed the recipe. Soak glutinous rice for at least 3 hours. Soak dried shiitakes, dried shrimps and dried scallop until softened. Chop shiitakes and shrimps into dices. Shred the scallop into smaller pieces with hands. Save the soaking water of dried scallop, add some more water to make it up to 1 cup. Add 2 teaspoons of water into the egg and beat the egg. Season with salt. Heat oil in a non-stick frying pan, add the beaten egg. Move the pan around and spread out the egg into a disc. Fry both sides until golden. Set aside. When it cools down, cut the egg into thin strips. Add diced lap chong in frying pan. Don’t need to add any oil because lap chong would release oil when frying. When some oil release, add shiitake, shrimp and scallop and saute until cooked. Set aside. Rinse glutinous rice and wash away the starch. Drain well. Add 1 to 2 tablespoons of oil in frying pan. Add glutinous rice, stir to coat the rice with oil. Then add 2 tablespoons of water at a time, cook on medium heat. Try to spread them in thin layer and let them cook evenly over medium heat. When the water is about drying up, add more water. Repeat the procedures of stirring, spreading the rice, adding small amount of water in between, until the rice is cooked thoroughly. The whole process takes about 25 to 30 minutes. When the rice is cooked, add seasoning and combine well. Remember to taste by yourself, then adjust to your personal taste. Toss back lap chong, scallop, shrimps, shiitake and egg. Stir and combine. Transfer to individual serving bowls, garnish with spring onion. Enjoy. It’s better to use non-stick frying pan to stir fry the glutinous rice. Otherwise you have to add a large amount of oil to keep them not sticking to the bottom of pan. When it comes to cooking this dish, the texture of the end outcome is quite tricky to control. Thus, add a small amount of water at a time along the way of stir-frying rice. If it dries, add water, if the rice is too wet, stir fry them until water dries up. The best texture of the stir-fried glutinous rice is soft, yet not chewy, soggy, nor lumpy. Each grain should be cooked through inside, and can be separated individually. To cook the glutinous rice from raw to being cooked thoroughly, the process seems to be very threatening and demanding. But it’s worth every effort when you enjoy this authentic Chinese stir-fried glutinous rice. Here’s a cheating way to cook this dish with similar results, saving more time and energy, without standing near the stove half an hour long. After soaking the glutinous rice for 3 hours, drain them well. Place a cheese cloth on the bottom of a steamer. Spread the rice out in a thin layer. Cover and steam over high heat for 20 to 25 minutes, or until the rice is completely cooked. Transfer the rice to frying pan and stir fry with other ingredients. Hi Christine! I'm glad I visited your website, as there are so many great recipes here! 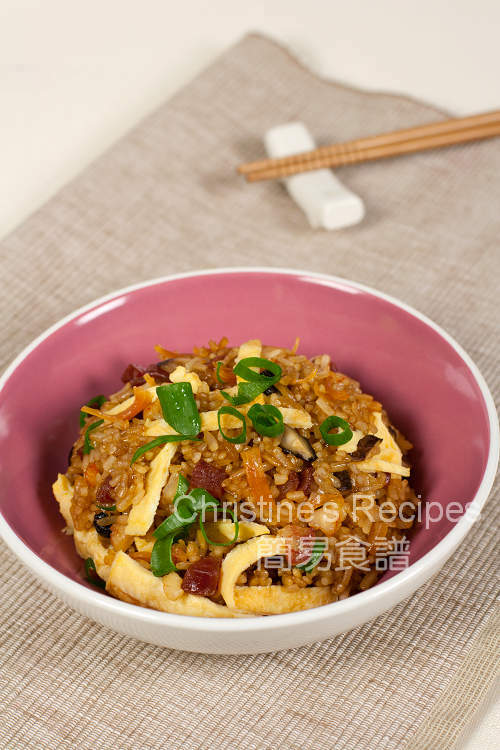 This stir-fry glutinous rice looks super delicious! Christine, the glutinous rice looks so delicious. I am lazy, I think I wil choose over cheating method :P My colleague ever used this traditional method to cook the glutinous rice, it is really very fragant and yummy. This is one of my son's fav dish. Haven't made this for him for a long time. Your pics looks sooo good. I love anything glutinous, whether savoury or sweet but have some problem digesting it well :( Love your version here....looks very delicious. I didn't know it's made like this traditionally. It does sound like making risotto. That looks delicious. I haven't had glutinous rice in a long time. Thanks for the reminder. I miss the stir-fried glutinous rice....used to have them with pork spareribs...marvelous! I just want to know how many servings does the dish make? Only 2/3 cup glutinous rice used for this recipe, equivalent to 1 rice cooker cup. Serves about 2 to 3 people. Note: You'll need less glutinous rice to feel enough compared to ordinary rice. I love glutinous rice but small amounts of it. Yes...I do think it is threatening to cook glutinous from scratch just by frying...I imagine it is going to take a long time! But you made it look quite effortless :) ..that's your power. What a great site you have here. Is this Lor Mai Kai? Sorry I don't read Chinese .. I always heard that it is difficult to make this yourself at home. But I rarely have the one I like at the restaurants, so maybe I should try your recipe. What a cool dish...never had anything like this before..I'll try this! hi christine..fried glutinous rice..hmm never try before..i'll try this one day.. just to inform u that i had copy your banana chiffon cake recipe n paste it to my blog and link it to ur blog. The cake sooo yummy n moist. i like it very much. Thank you so much. This is called Sheng Chao Lor Mai Fan that is stir-fried. But Lor Mai Kai is steamed in a lotus leaf. christine, thank you for posting this recipe~~ i am planning to make it in the next few days. a couple of questions, where do you buy cheesecloth from? and also, can the glutinous rice be cooked in a rice cooker??? You can buy cheese cloth from supermarkets. Yes, you can use rice cooker to cook glutinous rice. Sometimes I do this way. Add less water, about 70-80% of water compared to cooking the normal rice in a rice cooker. otherwise the cooked glutinous rice would be too soggy. Would it be very hard to make such a dish if I don't have non-stick pan at home? For the simplified method, does it require a non-stick pan? It seems to be very essential to use a non-stick pan if you don't want your rice too greasy. Say, if you use stainless steel wok, the rice would stick to the bottom of your wok and you need to add much oil to keep stir frying. Hi! I love sticky rice! But since I've become a vegetarian I haven't been able to savor one of my favorite foods. :( Now that I've found your recipe I'm really interested in making my own, vegetarian style! But I'm wondering what kind of Chinese veggies you think would help put more flavor in this dish? I will definitely add dried Chinese mushrooms but what else? Maybe water chestnuts? Love your blog! Dried Chinese mushrooms is the best and commonly used for this dish. Water chestnut is a good choice too. I guess you can use any vegetables as long as you like it. Not to use those with too much water, otherwise the glutinous rice would be too soggy. How about green beans, corn kennels, baby bok choy? Hi Christine! I just made this for lunch today and it is delicious. I was wondering - how much are you supposed to stir the rice? Mine came out a bit more moist and risotto like. I'm thinking I either used too much water or stirred too much, or maybe both! Would appreciate any insight you have. Thank you! I just added water bit by bit along the way of cooking and stirring the rice. Between every addition, I had to wait the rice had absorbed the water thoroughly. If your rice was too wet or moist, might be too much water added. Someone told me that I could steam the glutinous rice first. After it is cooked then mix in the fried ingredients and seasonings. Have you ever try this method? Yes, I heard this short-cut method. Will try some time later. Another method is add the soaked glutinous rice with water to the fried dry shrimps, mushroom, etc ( I also add diced chicken) then add seasoning to taste. Dish out and steam until done. Add chopped spring onions and egg strips as garnishing. My aunt told me I need to use banana leaves to cook glutinous rice? Have you tried this method before? Which one would you recommend? There are many ways of cooking glutinous rice. This is the traditional Cantonese Chinese way. You might try different ways to see which is the best suit yourself. I've tried your method today and it works. Everyone in my family loves it. Thanks for your recipe and detailed procedures. Can anyone tell me how to make this page in Mandarin? I love sticky rice, but is easier for me to read in Chinese words. Got the chinese version of this recipe on my chinese food blog here. You might like to take a look. Can the Thai/Lao style sticky rice (also steamed to cook) be used in this dish? I just stumbled on your website and it has become my Bible for Chinese cooking. For this recipe, what is the purpose for the cheesecloth? I have a Miele steamer and I want to try this recipe using the steam oven. Can I put the rice right onto the solid bottom tray without the cheesecloth? Or should I put the rice on a cheesecloth using a tray that has holes in it. I guess all these questions because I don't know the purpose of the cheesecloth. Thanks in advance. The purpose of cheesecloth is to help hold the rice when placing on a tray with holes. By this way, the rice will be cooked very quickly. If you use solid bottom tray, it takes longer cooking time. Hello Christine love your recipes! I wondered on your cheats version do you let the rice cool first or stir fry straight away? Also thinking if I have any left I might stuff it into chicken wings then fry :) I had this dish in a thai restaurant and tasted great! Don't need to wait until it cool at all, just stir fry straight away because you want hot fried rice. Yeah, stuffed chicken wings with this glutinous rice are super delicious. Forgot to ask can I put seasoning in the water and use it to stir fry the rice or do I have put seasoning last after the rice is done? I use to season towards the end of cooking because I can easily control the taste. This recipe is easy to follow and I have made twice as breakfast for my family. They love it. A little bit of patience goes a long way. Hi. I was wondering if there was anything I could substitute the Chinese sausage with. I'm pescatarian so it's quite hard to find a dim sum that tastes good AND is edible for me. Thanks. Dear Christine, I saw your this receipe very good, I just starts to learn cooking.. I have some leftover Thai glutinous rice (uncooked) which I used to make the mango stick rice, can I use this rice to cook your dish ? Sure, you can use it. I often get thai glutinous rice to cook. Hi Christine! Thank you for the recipe - have you ever tried making glutinous rice with a pressure cooker? I've had some success with using one for risotto..
Not yet tried this recipe with my pressure cooker. I have a multi-function cooker that can make risotto as well, without any pressure by default. Hi Christine, Thanks for sharing this recipe. Could you tell me what's the serving on this recipe? I need to orepare for 12 people. Thank you! This recipe yields for 3 to 4 people, depending on how hungry they are. Looked thru a few recipe n found Christine's with the most clear step by step guide. Just tried it. I am not a frequent cook. So advise to all amateur cook like me, pleas please follow Christine's advise to use non stick pan. I started with the usual stainless stain wok as the other pans in my house are kind of small. The rice turned out very sticky n at the end of stir frying, it became very very hard to stir n mix them. End result, the rice turn out to be soggy n a bit of uncooked rice. The grains also broken up to small bits. The look is simply horrible. Thank you for sharing this recipe. Love your blog so much. I am cooking this dish for the kids and elderly. As glutinous rice is not easy for digestion. I am planning to mix half cup of glutinous rice with half cup of white rice, instead of full cup glutinous rice. Do you think this is a good proportion? I am not sure the taste and texture will turn out as good? Should I cook the white rice first and at which stage to add in the white rice? I think it's a good idea to cook two kinds of rice separately as their cooking time and water absorption rate are very different. You can control the end result much easier if you do so.